Sunset over Pose Lake, a small lake accessible only by foot. The BWCAW area remained largely undeveloped until gold, silver and iron were found in the surrounding area during the 1870s, 1880s and 1890s. Logging in the area began around the same time to supply lumber to support the mining industries, with production peaking in the late 1910s and gradually trailing off during the 1920s and 1930s. :9–12. Some aspects of the BWCAW's management and conservation have been controversial. 1971 A rule limiting visitors to "designated campsites" on heavy-use routes is instituted by the U.S. Forest Service. Cans and glass bottles are prohibited from the Boundary Waters. According to the U.S. Forest Service, the measure is expected to reduce refuse by 360,000 pounds (160 t), saving $90,000 per year on cleanup. 1975 October, Eighth District Representative James Oberstar (D-MN) introduces a bill that if passed would have established a Boundary Waters Wilderness Area of 625,000 acres (253,000 ha) and a Boundary Waters National Recreation Area (NRA) of 527,000 acres (213,000 ha), permitting logging and mechanized travel in the latter area and removing from wilderness designation a number of large scenic lakes such as La Croix, Basswood, Saganaga, and Seagull. The bill is strongly opposed by environmentalists. 1978 October 21, Boundary Waters Canoe Area Wilderness Act, U.S. Public Law 95-495, is signed by President Jimmy Carter. The act adds 50,000 acres (20,000 ha) to the Boundary Waters, which now encompasses 1,098,057 acres (444,368 ha), and extends greater wilderness protection to the area. The name is changed from the Boundary Waters Canoe Area to the Boundary Waters Canoe Area Wilderness. The Act bans logging, mineral prospecting, and mining; all but bans snowmobile use; two snowmobile routes remain to access Canada; limits motorboat use to about two dozen lakes; limits the size of motors; and regulates the number of motorboats and long established motorized portages. It calls for limiting the number of motorized lakes to 16 in 1984, and 14 in 1999, totaling about 24% of the area’s water acreage. 1989 Truck portage testing. According to the 1978 BWCAW Act: Nothing in this Act shall be deemed to require the termination of the existing operation of motor vehicles to assist in the transport of boats across the portages from Sucker Lake to Basswood Lake, from Fall Lake to Basswood Lake, and from Lake Vermilion to Trout Lake, during the period ending January 1, 1984. Following said date, unless the Secretary determines that there is no feasible non-motorized means of transporting boats across the portages to reach the lakes previously served by the portages listed above, he shall terminate all such motorized use of each portage listed above. 1989 – U S Forest Service with the University of MN conduct feasibility tests on the three truck portages. It is determined that trucks should remain. 1990 – Friends of the Boundary Waters, Sierra Club and six other environmental groups sue to have trucks removed; CWCS joins the U S Forest Service as intervenors. 1992 – Appeals court sides with U S Forest Service that trucks should remain. Friends of the Boundary Waters and coalition appeal to 8th Circuit Court of Appeals. Trucks are removed from the three truck portages. 1994 – As a result of the Friends of the Boundary Waters lawsuit against the 1992 BWCAW Management Plan, canoe rests, pontoon boats and sailboats are banned from the Boundary Waters. 1999 – As a result of the Friends of the Boundary Waters lawsuit against the 1992 BWCAW Management Plan, the courts redefined the phrase ‘that particular lake’ and exempt permits were eliminated for property owners, resorts and outfitters on the Moose, Farm and Seagull Chain of Lakes. 1999 – Trucks return to two of the three truck portages, Prairie and Trout Lake portages, as a result of Congressman Oberstar including this provision in his 1998 Transportation Bill. Ernest Oberholtzer, is recognized today as a leading advocate for the preservation of the Quetico-Superior lake area and what would become the BWCA. Sigurd Olson, Minnesota author and conservationist, wrote extensively about the Boundary Waters and worked to ensure preservation of the wilderness. Dorothy Molter, known as the "Rootbeer Lady", lived in the BWCAW for 56 years (alone after 1948) until her death in 1986, and was the last resident of the BWCA. ^ "Land Area Report". U.S. Forest Service. 2004. Retrieved 28 August 2006. ^ a b c d e f g h i "Boundary Waters Canoe Area Wilderness Trip Planning Guide" (pdf). USDA – Forest Service. ^ a b c d e Searle, R. Newell (1977). Saving Quetico-Superior, A Land Set Apart. Minnesota Historical Society Press. ISBN 0-87351-116-6. ^ a b Churchill, James (2003). Paddling the Boundary Waters and Voyageurs National Park. Globe Pequot. ISBN 978-0-7627-1148-2. ^ a b Ojakangas, Richard; Matsch, Charles (1982). "Minnesota's Geology". Minneapolis: University of Minnesota Press. ISBN 0-8166-0953-5. ^ a b Heinselman, Miron (1996). The Boundary Waters Wilderness Ecosystem. Minneapolis, Minnesota: University of Minnesota Press. ISBN 0 8166 2804 1. ^ Weiblen, Paul W. (1971). "It's Written in the Rocks: The BWCA History" (PDF). The Conservation Volunteer. ^ Barghoorn, Elso S.; Tyler, Stanley A. (1965). "Microorganisms from the Gunflint Chert". Science. 147 (3658): 563–577. doi: 10.1126/science.147.3658.563. ^ Heinselman (1996), p. 18, Table 4.1. This figure is for solid contiguous areas of virgin forest; it does not include some smaller areas within cut-over forests, nor some shoreline areas of virgin woods. Id. ^ "ECS: Border Lakes Subsection". Minnesota Department of Natural Resources. ^ "10 years after the big blowdown". Friends of the Boundary Waters Wilderness. ^ "Alpine Lake Fire". bwca.cc. ^ "BWCA Cavity Lake Wildfire". bwca.cc. ^ "Turtle Lake Fire". bwca.cc. ^ "Gunflint Trail fire anniversary to be marked by tree plantings". KARE11.com. Archived from the original on 2015-01-22. ^ Etten, Douglas (2011-09-13). "Boundary Waters fire threatening homes, cabins". Lakeland Times. ^ Gabbert, Bill. "Smoke from Pagami Creek fire detected over eastern Europe today". Wildfire Today. ^ "Ont. smells smoke from Minnesota forest fire". CTV Toronto. 2011-09-13. Retrieved 2011-09-13. ^ "Smoke from Minnesota forest fire makes its way to Chicago's suburbs". Chicago Tribune. 2011-09-13. Retrieved 2011-09-13. ^ "Superior National Forest – About the Forest". 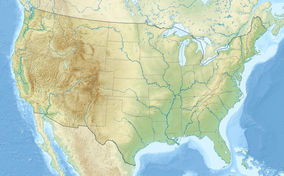 USDA – Forest Service. ^ Mech, L. David; Nelson, Michael E.; Drabik, Harry F. (1982). "Reoccurrence of Caribou in Minnesota". The American Midland Naturalist. 101 (8): 206–208. doi: 10.2307/2425312. JSTOR 2425312. ^ Furtman, Michael (2000). Magic on the Rocks: Canoe Country Pictographs. Duluth, Minn.: Birch Portage Press. ISBN 978-0-916691-02-8. ^ Morse, Eric W. (1969). Fur Trade Canoe Routes of Canada/Then and Now (PDF). Ottawa, Canada: Queen's Printer and Controller of Stationery. ^ Lass, William E. (1980). Minnesota's Boundary with Canada, pp. 47-53. Minnesota Historical Society, ISBN 0-87351-153-0. ^ a b "History of the BWCAW". United States Department of Agriculture – Forest Service. ^ a b Wilbers, Stephen. "Boundary Waters Chronology". Retrieved 27 September 2009. ^ Heritage History: BWCAW timeline, Superior National Forest, United States Forest Service. ^ Kelleher, Bob. "The Boundary Waters: 25 years later". Minnesota Public Radio. ^ Furst, Randy (14 February 2015). "Judge rules in favor of proposed snowmobile route bordering BWCA". Minneapolis Star-Tribune. ^ Hemphill, Stephanie. "At the edge of the Boundary Waters, miners probe for copper, nickel". Minnesota Public Radio. ^ Kraker, Dan, "Feds reopen forests near Boundary Waters to mining", Minnesota Public Radio, September 7, 2018. ^ Dvorak, Robert G.; Watson, Alan E.; Christensen, Neal; Borrie, William T.; Schwaller, Ann. "The Boundary Waters Canoe Area Wilderness: Examining Changes in Use, Users, and Management Challenges" (pdf). United States Department of Agriculture – Forest Service. p. 11. ^ Pauly, Daniel (2005). Exploring the Boundary Waters. University of Minnesota Press. ISBN 978-1-4529-0646-1. ^ Beymer, Robert; Dzierzak, Louis (2009). Boundary Waters Canoe Area: Western Region. Wilderness Press. ISBN 978-0-89997-610-5. ^ Beymer, Robert; Dzierzak, Louis (2009). Boundary Waters Canoe Area: Eastern Region. Wilderness Press. ISBN 978-0-89997-461-3. ^ "Border Route Trail Association". North Country Trail Association. ^ "Kekekabic Trail Chapter". North Country Trail Association. 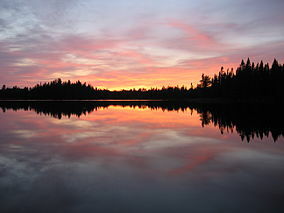 Wikimedia Commons has media related to Boundary Waters Canoe Area Wilderness. Fox, Porter, "On the Water, and into the Wild". The New York Times, October 21, 2016, p. 1. Proescholdt, Kevin; Rapson, Rip: and Heinselman, Miron L. (1995). Troubled Waters. North Star Press of St. Cloud. ISBN 0 87839 100 2.